I’ve been keeping my eye out for pretty tissue paper for ages. Seriously, y’all, AGES. And then one day at Target I spy this really pretty marbled tissue paper. Not truly marbled a good handful of sheets printed with 4 different marble patterns and they were super pretty. They were $8 for the set plus tax but I loved ’em and I had been looking for something pretty for ages. Why? 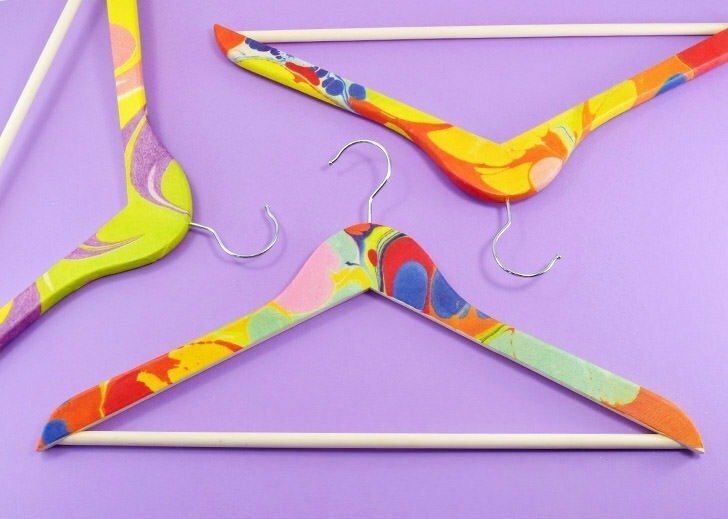 Because I wanted to decoupage up some really pretty wooden hangers. And guess what? I think these lovely ladies are going to be the belles of my closet! Want to see how to make your own? This project works best with Mod Podge and I prefer the matte formula but use whichever one you prefer. 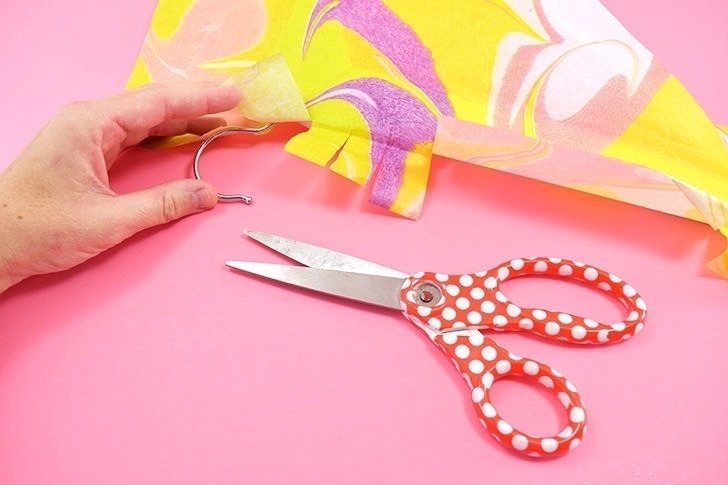 To make things easier to work with, cut your tissue paper to roughly the same size of your hanger plus a good 2-3 inches of overhang. This is far easier to handle than, say, the full 2′ x 3′ sheet, or whatever the dimensions might be. 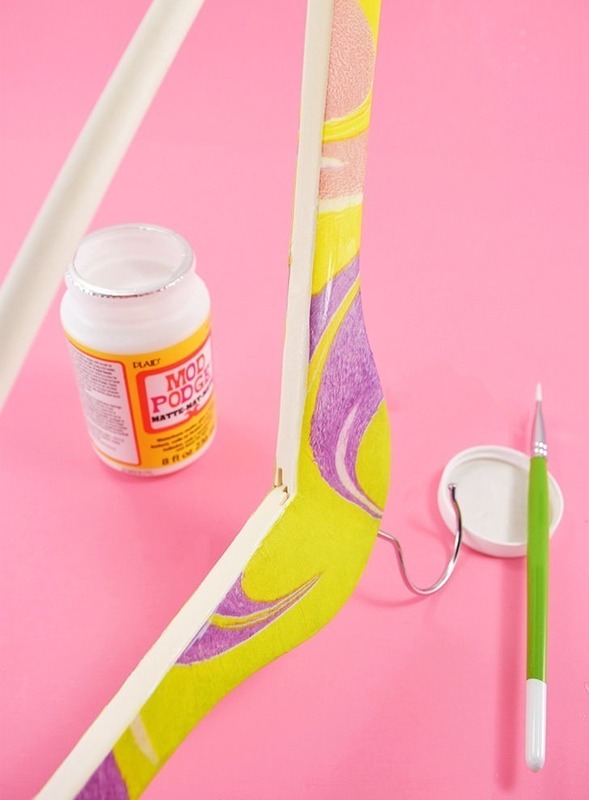 Brush on a tiny, tiny amount of Mod Podge in a small area right onto the wood near the hook of the hanger. 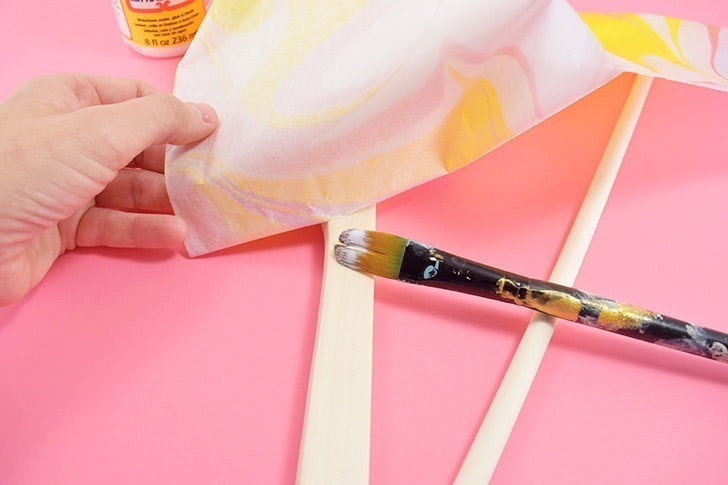 Place the tissue paper on top of the wet glue and use your fingers, or a squeegee to make the paper nice and smooth and remove any wrinkles or air bubbles. Now we only brushed on the tiniest bit of Mod Podge because the more wet the application the more likely it is that you’ll tear your paper as you smooth it down. 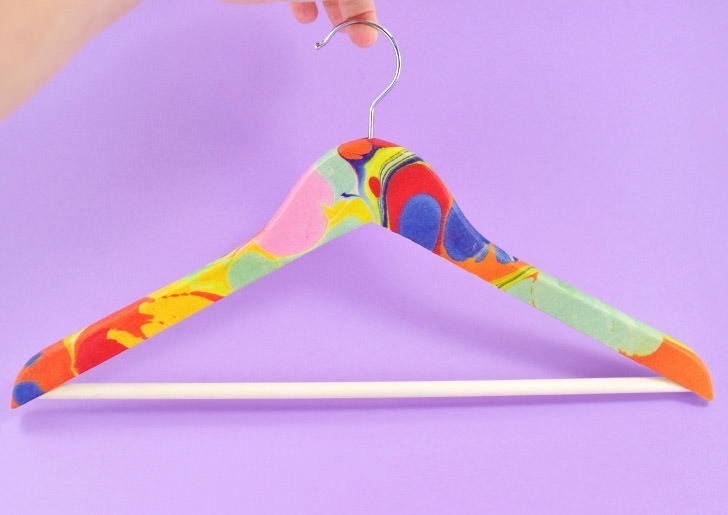 Trust me, a little goes a long way, and we’ll be sealing this project before use so if you’re just using enough that the paper will adhere to the surface of the hanger, you’re golden. Working in those itty, bitty sections, glue down the paper working from the left side to the right, allowing a little bit of dry time before you pass back to the other side. You want the paper to adhere in between sets and if you work too quickly you might just pull the paper up back off of the surface and have to do that section over again. Because I guess I’m a super fast decoupager, or just because my sections were really small, I found that I could work switching back and forth between 2 hangers to make the most of my time. 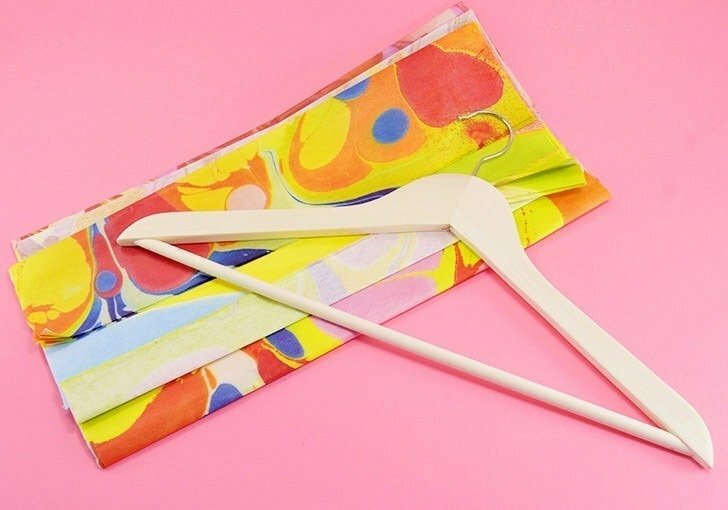 Once you get the front side of the hanger covered use scissors or a craft knife to make darts in the fabric along the top. 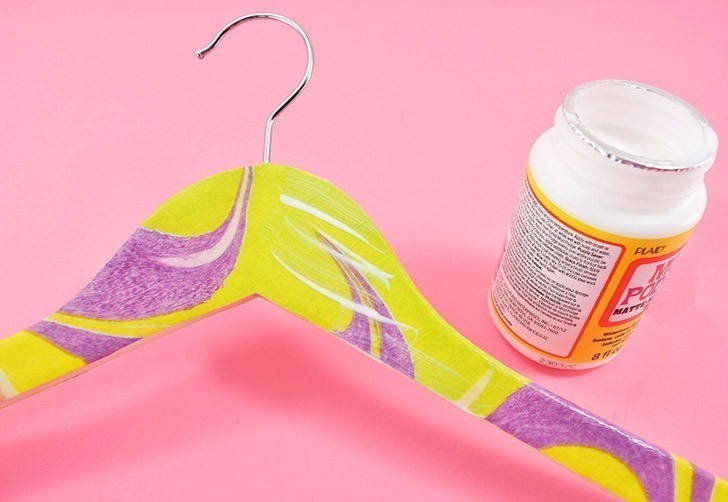 Glue the pieces down onto the top of the hanger, smoothing the sections and overlapping the paper when necessary for good coverage. 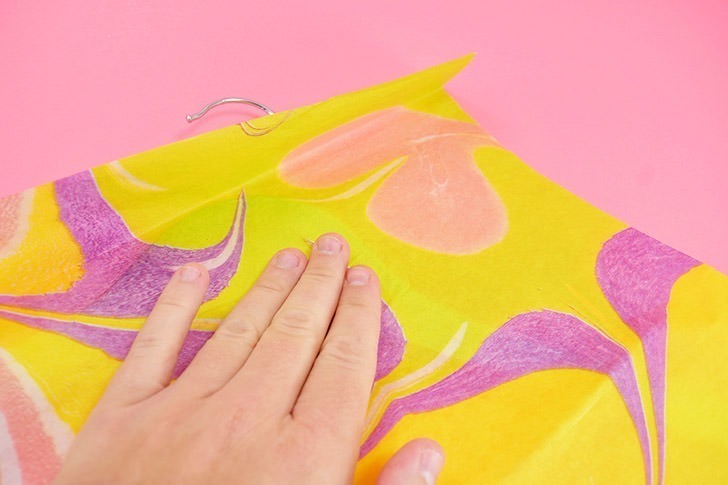 In some places, like the gap you see in the purple above, you might have to rip off, or trim away a piece of paper that matches to discretely patch the area. Allow to dry really well. Blades can be EXPENSIVE, I know, so if you’re wondering how I switch blades so frequently without breaking the bank, I actually purchase these off-brand X-acto blades from Amazon in a bulk pack of 100 and they are fab. Looking at my order history it seems like I purchase a new pack every 2 years for around $11, so that’s not bad at all when a five pack of blades from Walmart can easily run you $2.50-$4. 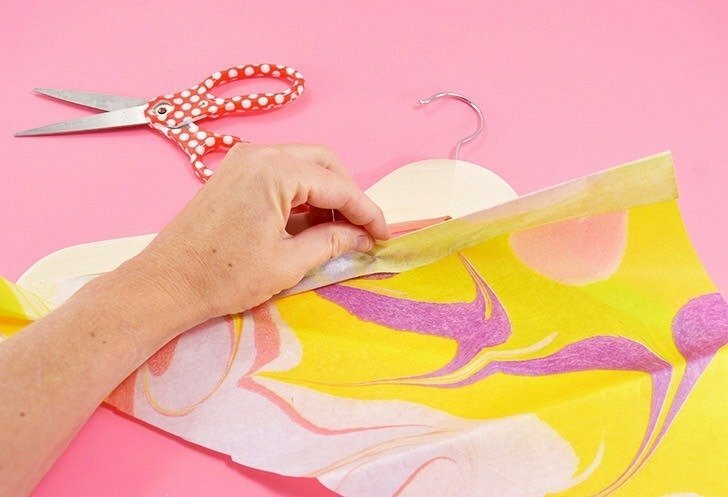 Once you’ve got everything trimmed, repeat the decoupage process for the backside of the hanger, trimming up the excess paper along both the top and bottom sides. 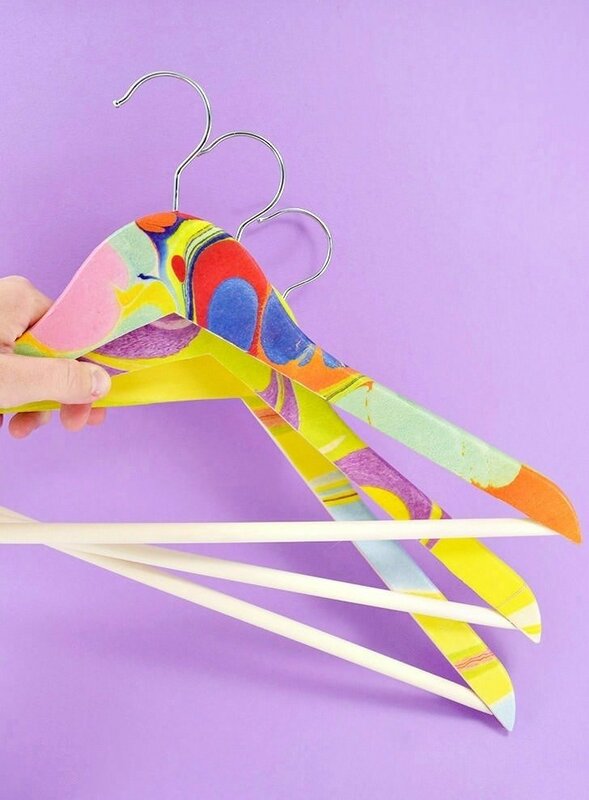 To make sure that your paper doesn’t peel away from the hanger easily during use you’ll need to seal the edges. I’ve found the best way to do this is to brush on a tiny amount of Mod Podge onto every edge, and into any areas where the paper isn’t stuck quite as well as it needs to be, and then use my finger to push that business down and seal it nice and tightly to the surface. 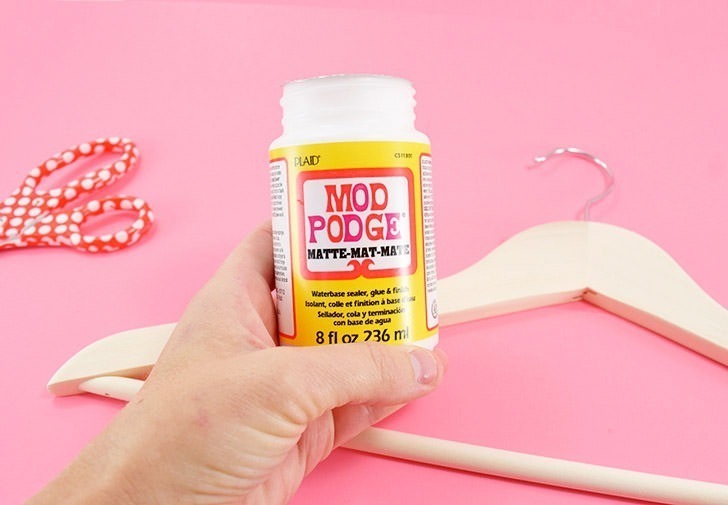 To finish each hanger apply a few thin coats of Mod Podge to the surface, taking care to cover everything well. 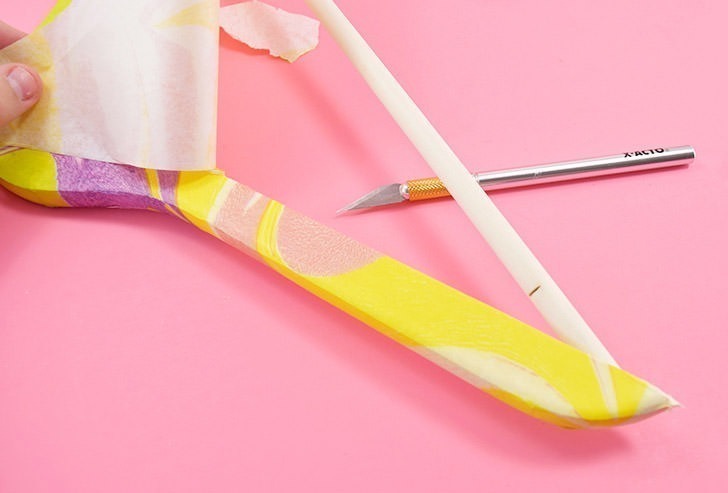 Allow each coat to fully dry before the next one and work in tiny amounts to prevent the paper from bubbling up or wrinkling beneath from the moisture. 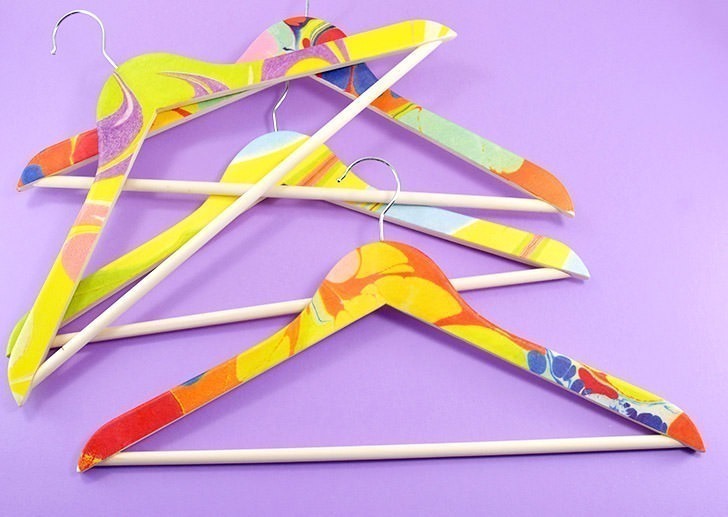 When fully dry give each hanger a once over, rubbing your finger along the surface to try and find any places that catch on paper that is loose. Fix anything as needed and allow to fully dry again. So what do you think? 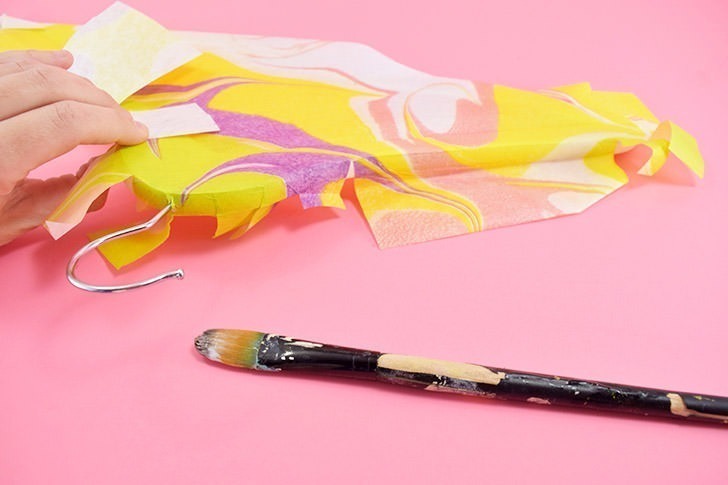 Are you going to be running out for marbled paper or are you going to keep your eyes peeled for something else? If you find some pretty floral tissue paper somewhere, give a gal a shout ’cause I need it!